Treat your little lad to jammies they will simply relish with Prince of Sleep's eye-catching blanket sleepers! 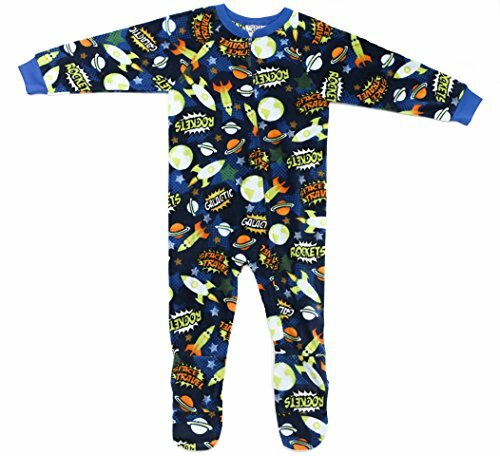 These footed PJs, with their cool prints that include everything from awesome fire tracks, epic dinosaurs, rad robots, high-energy sports, to the marvels of space, will capture your munchkin's imagination and get them excited for bed time. And to ensure that all this adorableness doesn't quickly fade away, we've combined premium fabric with high-quality dyes that keep the onesy jammies in lovely condition even after multiple washes. We believe comfort is everything when it comes to kids' sleepwear. That's why we've used ultra-soft microfleece made using 100% polyester to create blanket sleepers that don't itch, feel great against the skin, and treat your little one to toasty snugness to help them drift off to dreamland. And you'll love just how easy it is to get your cutie pie into these footed pajamas! They come with a full body zip closure to make getting in and out of the jammies a breeze. No more breaking a sweat to get the kids ready for bedtime. - Contrast ribbing on the sleeve adds to the eye-catching look. - Made using flame-resistant fabric for an extra touch of safety. - Available in 12M-14/16 to comfortably fit infants to big boys. - Have non-skid feet to provide great grip as the kids move about. - Machine washable for a hassle-free clean. Surprise your little boy with sleeper pajamas that combine supreme comfort with a heavy serving of cuteness.